Out in the great outdoors, one usually avoids grizzly bears, especially a defensive mama bear and her cubs, but with these cool new Sleeping Grizzly Bear and Cub Bean Bag Chairs, you can safely hibernate right along with them. 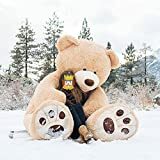 At first glance, they may cause startled screams, huge double-takes, and frantic fleeing, but once these sleeping bears are poked, everyone brave enough will soon discover that they're just somewhat realistic-looking grizzly bear-shaped bean bag chairs. The highly detailed bear graphics cover are knitted rom colorful yarns, not printed, and can be taken off for washing. 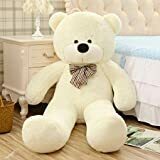 Not too hard, not too soft, these bears are just right for plopping down on to relax or hibernate, placing in unsuspecting spots for hilarious pranks, or just adding that certain missing something to your home's decor. Sold as a set or individually.